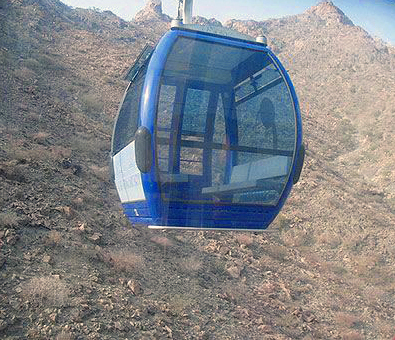 MAKKA: The Hajj and 'Umra Research Institute at Umm Al-Qura University has completed studies to introduce a cable car system to transport people to the historic caves of Hira and Al-Thawr in Makka. Abdul Aziz Saroji, dean of the institute, said the plan aims to facilitate safe trips for Hajj and 'Umra pilgrims as well as visitors to the holy city who want to visit the caves situated on top of Al-Nur and Al-Thawr mountains. There will be 12 cable car lines linking the mountain valleys with the caves situated on mountaintops. Adnan Qutb, director of the Research Excellence Center at the university, said the planned project is expected to be implemented within two years. Towers and huge pillars as high as the mountaintop will be erected for the project, Al-Madinah newspaper reported yesterday. Saroji said the institute carried out the studies following demands from the concerned departments and agencies who felt existing trips to the caves were too risky, as well as to make travel safe and comfortable. Thousands of Hajj and 'Umra pilgrims, including the elderly and women, used to visit these caves when they came to perform the pilgrimage every year. They had a laborious task climbing up the mountains. There were also isolated incidents when some pilgrims fell to their death from these mountaintops in the past. Saroji noted that the Research Excellence Center organized a workshop to review the outcome of studies. Senior officials of the concerned departments and agencies, including the Ministry of Haj, Ministry of Transport, General Presidency for the Affairs of the Two Holy Mosques, Umm Al-Qura University as well as top officials from the Civil Defense and Makka police attended the workshop. The Cave of Hira is situated on Jabl Al-Nur, 3.2 km from the Grand Mosque, where the Holy Qur’an was first revealed to Prophet Muhammad (peace be upon him). The Cave of Al-Thawr is four kilometers south of the Grand Mosque where the Prophet and his closest companion Abu Bakr lay hidden while they were on their way to Madina during Hijra (migration). Both caves have become major attractions for Hajj and 'Umra pilgrims as well as visitors to the holy city. There were also plans to establish cable car systems linking parking areas to the Grand Mosque in Makka in a bid to ease the transport of pilgrims. According to the plans, a dozen cable car routes will pick up pilgrims in Kudai, Rusaifa and Taneem. The project, a joint effort between the Research Excellence Center and the Transport and Crowd Management Center at Toronto University, is still awaiting the go-ahead from the higher authorities. The project involves the construction of 12 cable car systems linking the parking areas in Kudai, Rusaifa and Taneem with the Grand Mosque. There will be two cable car lines from Kudai, four from Rusaifa and six from Taneem. Please type '310' into this field.